After your baby is used to single vegetables try this tasty combination of three popular vegetables, all organically grown. The delicious aromas of the high quality ingredients used in all our Holle vegetable and meat and vegetable meals are retained through using a special closed cooking system, helping your child develop a love of good food. To increase the availability of essential fatty acids we recommend fortifying with 2 teaspoons Organic Weanng Oil, stir and slowly heat in water bath. Check feeding temperature. Gluten free, no added sugar, no added salt, dairy free, egg free, pureed texture. Stool loosening properties. 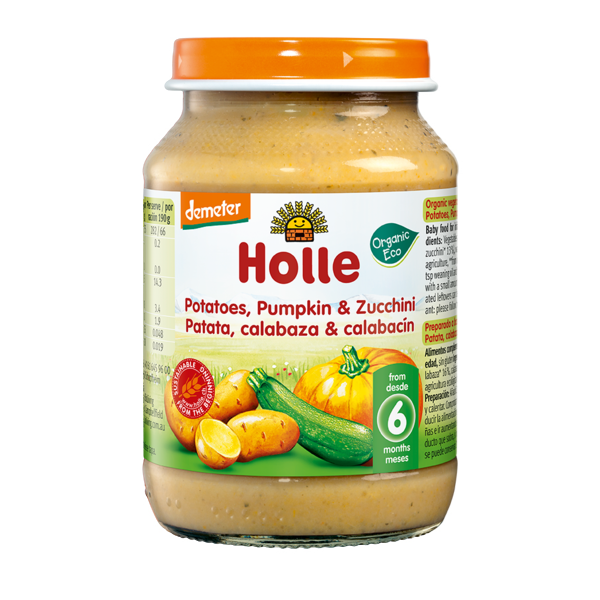 I have been really impressed with all of the jarred food I purchased for my little boy from Holle. Decent sized jars and once opened you have 2-3 days before it has to be eaten. I have to admit I was sceptical when I opened the first jar and smelled it, I don't find any baby food with pumpkin in very appetising... Well, baby thinks different, she loves this puree and this is already the second lot I ordered! This vegetable jar is excellent. It combines well with fish and eggs. Handy to have in the cupboard. Zebedee has just started moving onto food now as well as his formula and with another young child its sometimes difficult to have the time to make 3 different meals so to be able to grab one of these delicious organic baby jars is rather handy.